The Show #82.5: Hour 3! One thing that’s consistant with this group is that you can never be sure what’s going to fall out of their mouths! The convention in Tampa brings alot of comments and fodder for the gang. Al gets and in-studio gift on behalf of a friend of Shark Week, Marnie, Buddy and Clayton seem to be along for the ride as they gallop from one topic to another. Though not a commited viewer, Clayton gets chastised for even watching one episode of “Here Comes Honey Boo Boo“. This week seemed a little more tame as Al seemed to partake in the drinking game a little less than usual. 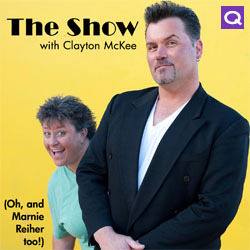 There are headlines, sports, random topics, laughter and vulgarity every week with the foursome known as the cast of “The Show With Clayton McKee”, thanks for listening, downloading and playing along! The Show #81.5: Hour 3! There’s something on the air…it’s chat…AND A LOT OF IT! After stellar intros from Clayton, the talking begins! There are so many things talked about each week, it’s like they need someone in studio to make notes and keep track of what all is going on. Buddy is REALLY excited to be here this week (causing us to wonder about the other weeks), Marnie has decided to give shout-outs every week to people we don’t know, Al bring up actors and others that only he knows about, oh and he interrupts the others. (But that’s weekly) There is always fine-tuning going on, so if it sounds different it’s probably because it is. “4-4-40” (4 people, 4 lists and 40 minutes) continues with not everyone having a list. Lazy. As always, thanks for listening, downloading and playing along! The Show #80.5: Hour 3!